Why a marriage guide for clueless guys? Do you really have to ask? Does a guy know the 10 Fatal Words his wife will spring on him days before her birthday? Does a guy know why he should never throw away his wife’s “bag of bags”? Does he know why he should avoid watching romance movies with his wife once he’s been married for a couple of years? No, no, and most definitely no! Millions of men are clueless about what to expect from marriage and need practical advice from a guy who has been there and seen it all. Candid and humorous, You Exhaust Me, A Clueless Guy’s Guide to Marriage, speaks directly to clueless men (married or planning to marry) everywhere. With more than 20 years’ experience (and counting) as a husband, Bob Marsocci provides valuable insight on what guys should really expect after the wedding rings go on. Bob’s personal and often hilarious marital anecdotes and lessons (often learned the hard way) will enlighten any soon-to-be or newly married man. If that’s you, take it from a formerly clueless guy: If you want to avoid hearing “You exhaust me!” from your wife, read this book. It’s got the secret sauce to keeping her (and you) happy. 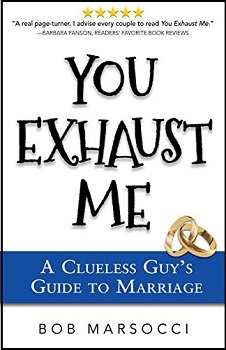 ‘You Exhaust Me: A Clueless Guy’s Guide to Marriage’ is written by American author Bob Marsocci, who shares a glorious tongue-in-cheek account of his unwitting misdemeanours after getting married. The structure is very straightforward, with each chapter focusing on a particular area of danger for the unsuspecting husband and is headed by a suitable quotation. Marsocci uses anecdotes which readily put a smile on the face of his reader. He doesn’t labour his points too heavily so each chapter is relatively short, keeping the book flowing along nicely. I found myself laughing out loud more than once as I identified with the author’s wife and indeed felt a degree of solidarity with her. It’s true! We’ve all expected a degree of second sight from our husbands that they don’t possess: birthdays, bags and bed cushions – it’s all there. As a Brit, references to the Red Sox and various sports and media personalities didn’t mean anything to me. I suspect the author has written mainly with an American audience in mind but nonetheless, the humour mostly transcends the Atlantic intact. If you’re looking for a serious self-help book this is not it. Bob Marsocci doesn’t purport to be a marriage guidance expert; he’s a chap with over twenty years’ experience of marriage, now passing on tips to try to stop others from tripping up. Indeed perhaps it should be a mandatory read for every would-be bridegroom. 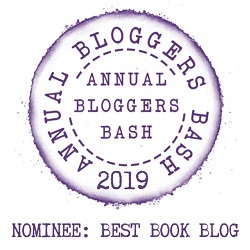 In spite of some of the analogies not working for me and the title being a little cumbersome, this would make a great Secret Santa gift for a friend or colleague at Christmas and I have no hesitation in awarding a fun-filled four stars. How did a guy who is wholly unqualified to provide marital advice end up writing a book giving that very thing? Good question. After more than 20 years (and counting) as a husband–that’s more than 192,000 hours as a married guy–I figured I had enough experience to write a marriage guide book to help other guys who are or will soon be married. (The best-selling author Malcolm Gladwell said you have to have “10,000 hours experience in a subject to be an expert.” So by that measure, I’m a mega expert in marriage). I readily admit I was (and my wife says I sometimes still am) a clueless husband. I wrote You Exhaust Me because I know that there are a lot of guys who could benefit from my experience and lessons learned (often the hard way). If I can help even just one guy–whether he’s engaged, a newlywed or even if he’s been married for years–get a clue, well, mission accomplished. I grew up in New England but have called Southern California home for many years.